Media has evolved over the years and has existed as long as information needed to be passed. In the olden days, information was passed through Group heads, Town criers and Messenger. This evolved over time into the Print newspaper system which operated successfully albeit with its geographical barriers. The world was thereafter introduced to the era of radio and television and subsequently witnessed the emergence of the Internet which changed the whole game till date. In view of this evolution and the potential for further disruption in the dynamics of Media, Blanche Aigle, communications,public relations agency headquartered in Lagos,will be hosting a fine selection of media personalities, agencies and enthusiasts to discuss the Future of new media and how we can tap into it effectively. Media has always been a major tool for marketing communications, particularly Public relations. Also, it has been an effective way to show and enlighten the public about the success, strengths and desires of an organization or individual. With the birth of new media, we’ve seen advancement from the regular television adverts, radio jingles and billboard adverts to include other media marketing forms such as: Influencer marketing,Content marketing,YouTube& Google adverts, Mobile adverts amongst others. 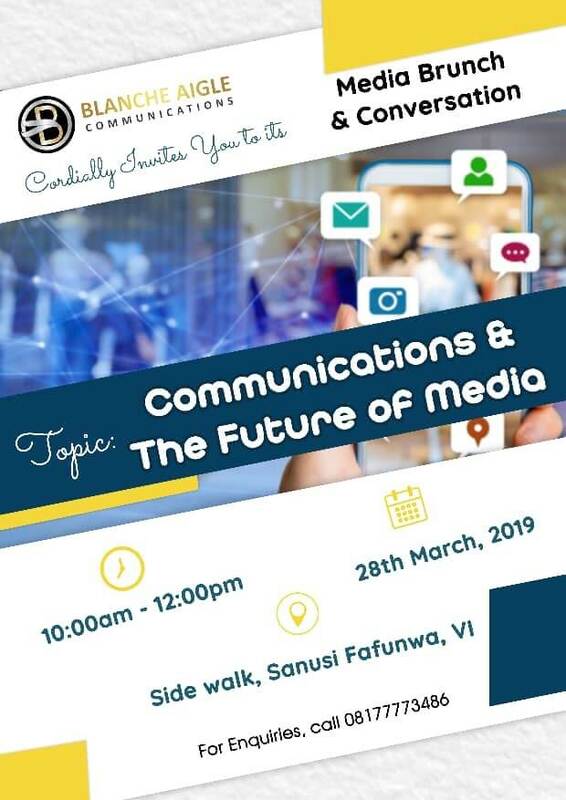 The purpose of this media gathering is to discuss the evolution of media, new tools and emerging trends; most importantly, understand how we can effectively apply the same and to further project the future direction of media over the next course of years. This will enable Media practitioners keep abreast of recent industry happenings and also stay ahead of the curve, both of which are crucial to maintaining relevance in the industry. At the event, we will also be sharing experiences and uncovering hidden opportunities in the media. Leading the round table discussion are: Lehle Balde, Strategy & Partnerships, Business Day Newspaper, Charles Odii, Founder SME 100 Africa and David Adeleke, Editor Business Insider. Roundtable discussion will be moderated by Nene Bejide, Founder & CEO of Blanche Aigle Communications. Why is NERC paying to find out if consumers want meters?